October was a busy month for us. We had a productive time at the Copswest Tradeshow, sponsored by the California Peace Officers Association. Thank you to all that attended and visited our booth. We had a great turn out and our RFID Asset Tracking System was well received. We are looking forward to participating again next year. Think you have the messiest office around? Prove it by submitting a photo to the Olpin Group and you could win an ergonomic chair or workstation system for your office! Click to enter the contest on our website. Olpin Group was recently awarded the bid to plan, design and install workspace and storage solutions for the law firm Christie Parker & Hale LLP. Jurupa Valley is one of California's newest cities, officially becoming a city on July 1, 2011. The Jurupa Valley Sheriff's Station now services the cities of Norco, Eastvale and Jurupa Valley. Due to its continued growth, the sheriff's department will be moving into a larger building and is looking for more efficient ways to store its ever-expanding number of case files and mounting evidence. Watch for us at the Cops West Trade Show on November 8 and 9 at the Ontario Convention Center. We will be set up in booth #217 and would love if you would stop by and check out our products! For a full schedule and more information on this event, please visit the Cops West Trade Show website, www.cpoa.org/COPSWEST/tabid/9026/Default.aspx. As some of you may know, Olpin Group and ANEW were proud sponsors of the 9th Annual LA Kidsave Miraclemakers Golf Classic fundraiser on September 26. We are proud to have participated and thankful that we could take this opportunity to help make a difference in our community. A Southern California City Police Department recently needed to upgrade and improve its armory and the way it handled the daily distribution of its weapons. The small armory room, at just 9.5-by-14 feet, proved to be a challenging space for keeping their large quantity of weapons stored while keeping them secure and accessible to the Armorer. Olpin Group recently revisited the Jones Day law offices in Irvine. It has been two years since the firm completed outfitting its new office building. 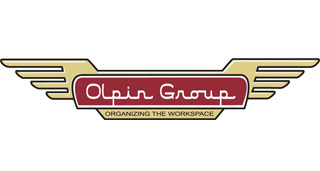 The office is magnificent -- it is neatly organized thanks in part to the Olpin Group's office and storage solutions. When you typically think of an expansion, you think of adding more offices, a new wing, or a building. However, eBioscience -- with help from the Olpin Group and mobile storage racking systems -- was able to nearly double the amount of usable space without adding a single square foot during a laboratory new expansion and remodel. 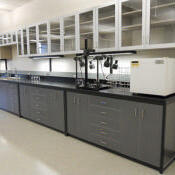 Olpin Group recently completed installing a high-density shelving system at Camp Pendleton. Olpin Group is excited to add Safeglow products to its line of offerings. This socially responsible and engaging company provides businesses with safe, effective emergency lighting products that utilize Photoluminscent technology. ANEW is dedicated to extending the life cycle of surplus, building assets and architectural materials, and diverting waste from landfill, through repurpose, reuse, resale, recycling, recovery of energy-from-waste, and reporting through our net effect metrics. Olpin Group will be contracting with National IPA starting April 1, 2011, which means if you are a city, state, or local government agency, or a nonprofit or hospital, we can help provide you with extensive discounts on Aurora storage products and a number of other products and services. Times Two's are the original rotating locking cabinet that provides more storage in a smaller place. What do guns, parachutes, motor parts, books, pharmaceuticals, and files have in common? Thanks to Olpin Group, all of these items on a local military base are being stored safely. 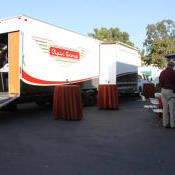 If your company or organization has a lot of things that you need to store and make easily accessible, Olpin Group's mobile storage units are the perfect solution. Olpin Group offers Modular Millwork storage components to help clients stay organized while allowing them the flexibility to "reconfigure, relocate and reuse" these components as workspace needs change. Olpin Group recently finished an extensive military installation that helps the client store and organize an enormous amount of materials and equipment: parachutes, weapons, ammo, books, manuals, pharmaceuticals, gear bags, oxygen masks, and so much more. 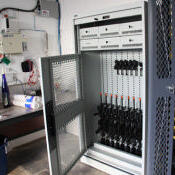 Olpin Group team member Tim Rudge has been hard at work collaborating with the Border Patrol to design a specialized storage system for all of its different supplies and gear. While we certainly love it when clients come to our office to say "Hi" and check out all the storage solutions and products we have to offer, we know that this isn't always an option for some. So, we decided to make it easier for our clients to get an up-close and personal look at our products with our Traveling Showroom! The president of Modular Millwork discusses the flexibility with Modular Millwork products. San Diego Archeological Center staff explain how they utilize a High Density Mobile shelving system from Olpin Group to store thousands of years of history.